"Now that's what I'm talking about! Second chapter and I have goose bumps! Hope the book stays this way!" I loved it! There was never a dull moment and the story remained at the same pace from page one until the end. Kelly Keaton blended everything into the story perfectly. Everything happened right at the right moment and it all made sense. Am I making sense here LOL? It did not seem rushed, but did not run slow either. I actually got goose bumps a couple of times while reading. For a YA novel, it was very dark and action packed with a little taste of romance. What I LOVED the most was that it was a very different type of paranormal story. 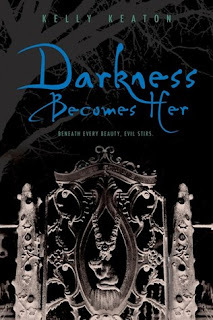 Without giving anything away, I will say that I’ve never read anything like Darkness Becomes Her. It is very unique and the world Kelly Keaton has created is very believable. It was something new and refreshing. The only issue I have now is that I was lucky enough to read an eARC of Darkness Becomes Her, so the wait for book two is a long one. If you’re looking for a different kind of paranormal story, than I highly recommend Darkness Becomes Her. I promise it will be nothing like you’ve read before! I read this one and loved it. The plot was so good! Nice review! I liked this book, it did have a different type storyline, though I had it figured out from the beginning who she was so that took a little of the surprise out of the ending..I was just like see I knew that. I am interested to see how the second book will be though. I have half way through and having a hard time getting anything done besides reading. Great review. I liked it too! Part two is gunna be bomb cause there was some serious threads left unanswered. Glad to hear you enjoyed this one! I have an e-galley sitting on my Nook, and I've been trying to decide where I should put it on my TBR list. Thanks for sharing your thoughts! Ive been eyeing this book off and what better way to try and win it !! Loved the interview !! I have not read any of Kelly's work but certainly cant wait. !! Most embarassing moment as of late,, realizing after shopping in town all day that my pants had split right up the inside leg to almost my knee cap. You would think that one would realize this lol.. but no .. all day then come home to go to toilet and realize.. how embarrasing !! wish someone had said something.. **How did I not notice ** was the more embarrasing part !!! Thanks for the great comp an for making it international ;) Look forward to more reviews !! I agree. This was a fabulous book! I cannot wait for the sequel! This book sounds so good, I can't believe I still haven't read it yet. i'm curious about this book! Everyone seems to love this book; I shall have to check it out. :) Thanks for the review.